Although the pounding forces of nature forged the Oregon Coast thousands of years ago and volcanic explosions—and implosions—left their distinct marks on the landscape with a series of mountain ranges (and craters and lava tubes) throughout the state, over the course of just one single year seven spots in Oregon have been singled out as the state's "seven wonders." To be specific: Crater Lake, Mount Hood, the Wallowa Mountains, as well as the entire Oregon Coast and the full scope of the Columbia Gorge, and, in Central Oregon, the Painted Hills and Smith Rock. Nope, these seven wonders are not some God-appointed list or even the result of a Facebook survey, but instead are the work of Portland-based Weiden + Kennedy, the same company that has designed the globally successful Nike campaigns over the decades. Launched last summer for Travel Oregon, the campaign has quickly worked its way into Oregon's established lore. 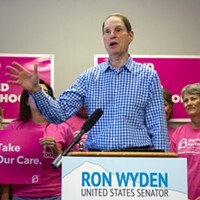 To a large degree, the campaign has been successful because it was quickly picked up by media outlets like Portland Monthly and the Oregonian—and now, they have been further knighted over the past week or so as Sen. Ron Wyden has traveled to each site and conducted a series of "listening sessions" about the state's recreation economy. The sites are truly breathtaking, from the barren, but magically colorful landscape of the Painted Hills to the sweeping vistas of the coast—and, moreover, these areas have increasingly become pillars of the state's economy. State officials estimate that travel and tourism exceeds $10 billion in its overall impact on Oregon's economy, and supports roughly 100,000 jobs. All told, one-quarter of visitors to Oregon are drawn here precisely because of the outdoor recreation and sights—a number that doubles the nation's average. Kicking off his tour, Sen. Wyden proclaimed, "You can't spell great recreation without the letters O-r-e-g-o-n."
Just a week earlier, Sen. Wyden co-introduced with Sen. Jeff Merkley a bill to protect some 200,000 acres of wildlands in the state. In the late afternoon heat of July 1, Wyden's caravan pulled into Smith Rock State Park and the following morning, he hosted another listening session at Painted Hills State Park. After his sessions, the Source caught up with the senator's press secretary Hank Stern to hear thoughts and reflections. Source Weekly: How did the idea for these listening sessions come about? Hank Stern: Oregon's recreation and tourism economy has grown to the point that it's become a huge economic engine in every corner of our state. That growth didn't happen by accident. Travel Oregon and its Seven Wonders campaign account for a huge part of that increase. That work has brought travel and tourism throughout Oregon to a place where it now supports an estimated 101,000 jobs—to put that number in context, it's bigger than the entire city of Bend. Sen. Wyden thought that the week heading into Fourth of July weekend would be a great time to meet with the local businesses at each of the Wonders and hear directly from them about how we can build on what's already been accomplished through their sweat equity and Travel Oregon's hard work. SW: At the two Central Oregon stops, was there a primary theme that emerged from comments? HS: One theme Sen. Wyden heard is that the little things add up—in other words, there are common-sense actions that can help the recreation and tourism businesses continue to flourish. 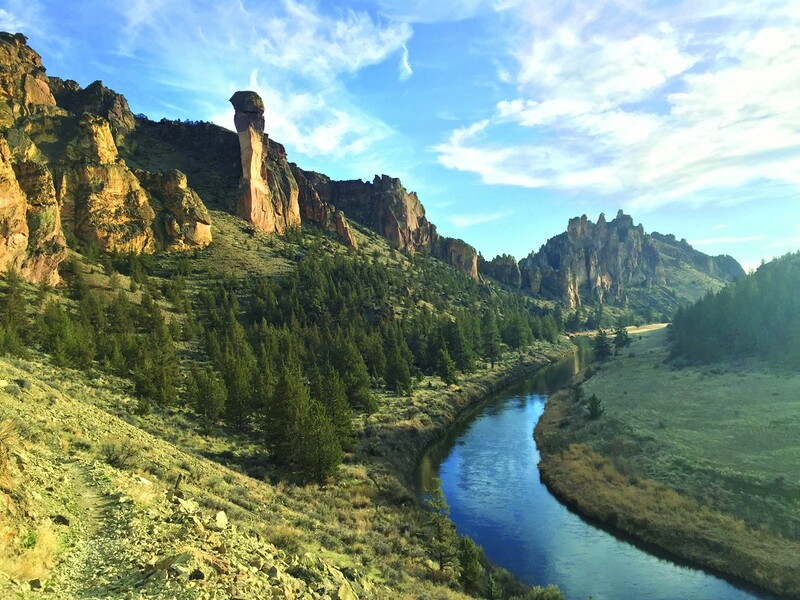 An example of that was heard at Smith Rock, the Painted Hills, and pretty much every stop on his weeklong trip—how permitting in some instances should be simplified. Another theme that emerged was the need to make sure recreation is always accessible to low-income and middle-income families so that every child in Oregon and in the country can experience the health benefits of getting outdoors. A third theme he heard is that the recreation and tourism businesses have room to keep growing. As but just one example is the growth with recreation businesses outside Smith Rock—that meeting was at Terrebonne Depot where business is up 17 percent. SW: There is obviously a balance to strike between preservation and use. Are there concerns that encouraging a "recreation economy" encourages overuse? HS: There is obviously a balance to be struck, and we definitely heard that we don't want our special places "loved to death." What Sen. Wyden heard at the listening sessions is that people recognize each treasure needs to be preserved and protected so that everybody can continue to enjoy Oregon's natural icons and in some places we need to make sure the infrastructure is adequate for the people who are visiting. SW: What happens from the listening sessions? Is there a plan for what actions will emerge from the comments? Any programs or legislation? HS: Senator Wyden's hope going into these listening sessions was to hear from people on the ground about what actions we could take that will create the economic climate for them to continue doing what they do well—providing an unmatched experience for tourists and creating jobs in every part of our state. That hope was clearly met with all the fantastic feedback we gathered. We will take all that feedback and work in the months ahead on legislation, or other actions, that incorporates all the good suggestions we heard.